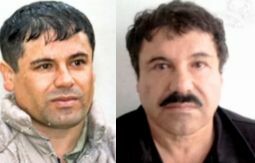 13 more former prison officials and guards have been arrested and detained over the escape of Joaquin "El Chapo" Guzman, including the ex-head of Mexico's prison system, Celina Oseguera Parra, and the ex-warden of the prison at Altiplano, Valentín Cárdenas Lerma, both of whom were fired days after El Chapo's escape (use Google translate for this and subsequent links). Mexico now says the U.S. is unlikely to play host to Joaquin "El Chapo" Guzman anytime soon. "I could accept extradition, but at the time that I choose. 'El Chapo' must stay here to complete his sentence, and then I will extradite him," Murillo Karam told The Associated Press in an interview. "So about 300 or 400 years later — it will be a while."